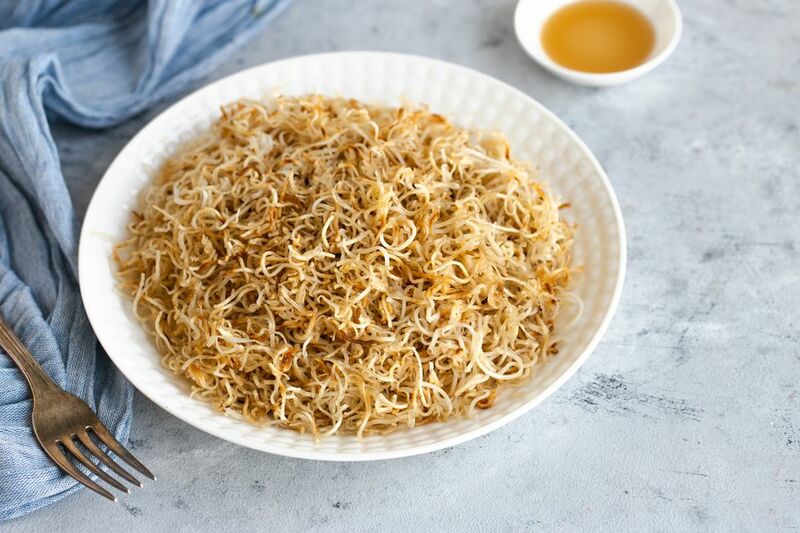 This recipe goes by several different names, including "both sides browned" and "twice browned" noodles. In all cases, the boiled noodles are cooked to golden on one side, then turned over and cooked on the other side. If desired, the noodles can be placed in a cake pan before frying so that it forms a more attractive shape, but this isn't necessary. After frying, the noodles should be crispy on the outside, but still tender on the inside. In a large saucepan, add enough water to cover the noodles and bring to a boil. Add the noodles, stirring to separate. Cook until the noodles are al dente—tender, but still firm. Drain thoroughly. Rinse with cold water, drain again, and toss with the sesame oil. In a heavy frying pan or a wok, heat the 3 tablespoons of peanut oil over medium-high to high heat. Add the noodles. Quickly spread them out to the edges of the pan and let them cook without stirring until they are browned on the bottom. This will take about 5 to 8 minutes. Remove from the wok and plate. Keep warm while preparing other ingredients for your meal.